On my way…home to Lake Tekapo and near Irishman Creek, this amazing scene unfolded just as the sun was about to set behind the Southern Alps. 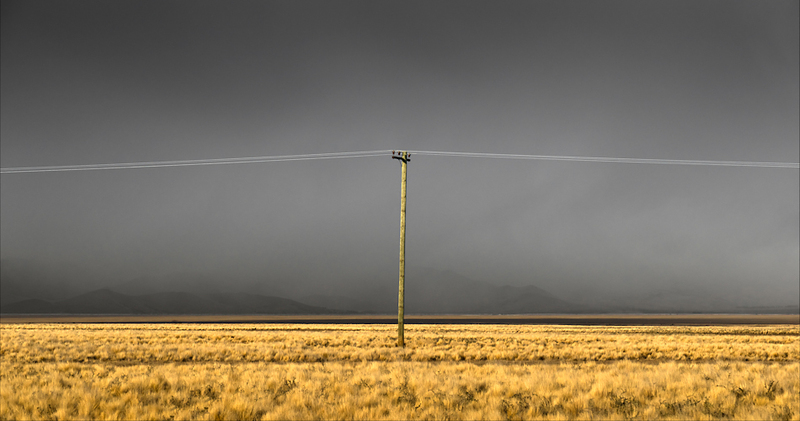 The stormy sky and the low evening light on the tussock created a simple composition around the power pole. The power pole in isolation inspired the title “Ascent of the Mackenzie”. I saw it as representing the beginning of New Zealand’s thirst for energy and transforming part of the Mackenzie Country into a major hydro electric power development. Welcome to my newly-designed online photography portfolio! With collections of new photographs alongside client favourites, my aim is to present to you the New Zealand landscape as fine art photography. My blog will tend to be brief and in a format that will simply show an image supported by a back story. The back story will have relevant content such as location, time and especially the thinking and craft essential to realise an image in print. I’ll begin each PhotoBlog with “On my way…” many images are captured in places where photography was not my primary goal and… on my way…the weather, the light and landscape combine to create beautiful moments of serendipity I can not resist. I also want to share with you inspiring websites, technique & tips I have stolen along the way and any thought-provoking work from the art world. Your feedback and any discussion will be very welcome, I look forward to talking with you.